Any webmaster knows the importance of a good FTP program. Although we can accomplish FTP requirements through a command line program, whether it be on Windows or a flavor of *nix, that is not always the most efficient way. A good program is typically advertised as a commercial software application with an associated commercial cost. While this is true in some cases, such as FlashFXP and CuteFTP, there are many options out there that provide great functionality at at an even better cost: free. I have listed 5 of the best below. You can click on the icon to see a screenshot. | FileZilla - This is probably the most popular free FTP program available. It has a large following, in part due to it being an open source program. That certainly isn't the only reason though. FileZilla is not as nice to look at as SmartFTP, but is very fast and efficient. The program uses very little resources and provides all the typical functionality required in an FTP program. It boasts features like drag & drop, transfer queues, resume, large file transfers, and many more. If you don't care about the appearance and you just want a fast, easy, and full featured program, this is your program. | FireFTP - This is an add-on for FireFox. Don't be fooled by its simplicity though. It has many of the same features covered in the first two programs. FireFTP supports searching, remote editing, drag & drop, FXP (FTP to FTP), CHMOD, synchronization, and more. Although this harnesses the framework of FireFox, FireFTP is a good choice for many. | GoFTP - This program presents itself as the fastest multi-threaded FTP program available, working 314% faster than its competitors. Speed and ease of use are the biggest sellers for this program. GoFTP will also perform "on the fly compression," as well as instant connections and directories through its proprietary technology. It also supports the usual features, drag & drop, and transfer queues. This is another good alternative to a paid program. | WinSCP - This program doesn't have anything that I think separates it from the pack, but is still a good program. It supports all the common features like drag & drop, synchronization, and the common file operations. One thing I might point out is that is does offer a command-line interface and batch processing. This is an interesting feature to add because if I wanted to use command line, I'd use the basic FTP programs that come bundled in windows or *nix. At any rate, it works well and is a worthy entry in the list. | CoffeeCup Free FTP - This program is a basic no frills FTP program. It offers all the features necessary to be a FTP program like ASCII/Binary/Auto uploads and downloads. It connects to any FTP server, is capable of multiple server profiles, and remembers your server information. It is not the best looking program but it does what is needed and is best of all, free. What FTP program do you use to meet your needs? Please comment below and let us know what else is out there. I’ve used 3 out of the 5 you listed on Windows, and Transmit on the Mac which is really nice. I had MAJOR problems with Filezilla a couple of years ago, it would just stop after uploading many directories which in turn contained sub-directories. But then you’d find that not everything was actually uploaded, even though you’d checked the box saying “overwrite” everything. You had no message…nothing! I quickly stopped using it. On a semi-related note I wonder if FTP is a dying protocol in favour of SSH (SFTP) and subversion for deploying files. I must say that I rarely use straight FTP anymore. I’ve tried them all, and would have to say WinSCP wins hands down. Watch out with GoFTP – the free version appends a ‘transferred via GoFTP’ or some such message to the ends of text-based files transferred. I didn’t notice this was happening to my HTML files for a few weeks, and then noticed that at the bottom of my website! Yak. I’m using FireFTP inside Firefox now, and what’s really great about this is I noticed recently that when you back up your FF installation with MozBackup, it also backs up the FireFTP stuff. Very handy. WinSCP has a terrible UI but as the only (?) one listed here that support SFTP (FTP over SSH) it’s the only sensible choice. These days, using unencrypted FTP on public machines isn’t terribly wise. FireFTP is good for internal use though. hmmm… my mistake. They’ve added SFTP support to FireFTP. Cool! Also I used Filezilla and it’s excellent. FireFTP is a great tip, will try it. AceFTP 3 Freeware from Visicom Media contains virus. i’ve downloaded it once and suffer from it. now i’m not able to uninstall the software because it says it is an application file! how come you haven’t mentioned ‘Filezilla’? I thought they’re one of the best. I’ve had major problems with Filezilla. It stores user names and passwords on your local machine in an xml files. If your local machine has security issues … bang, all your websites a compromised as well. Unfortunately, it caught me and I’ve been chasing it ever since d/loading Filezilla. Although I once thought it as great, it’s got issues that have made me delete it altogether. i will try fireftp!! !fireftp FTW! I don’t think I trust any best of FTP list that starts with filezilla. Also a list that states Winscp as not having anything that separates it from the pack. It offers SFTP, and it’s reliable. It has everything you need. Other than it not being offered in a x64 version. The command line thing is true though, odd feature. I’m not saying this is the best mind you, but it’s certainly better then filezilla. Fireftp is certainly a goody compared to filezilla as well. Core FTP does all the FTP types and the SFTP is the fastest one out there. Tried them all upon ur suggestions, I cosign on what Rob said. WinSCP won hands down! GoFTP works with win7? keeps getting run time error 6 overflow LOL? Keep well away from GoFTP. They alter your HTML files on the way up to the server and add links to their site and other sponsors. Seriously !!! Should be illegal. Have no idea why major people like CNET would even host this crap, let alone people on this page recommending it. re: WinSCP: “This program doesn’t have anything that I think separates it from the pack…” Are you serious? 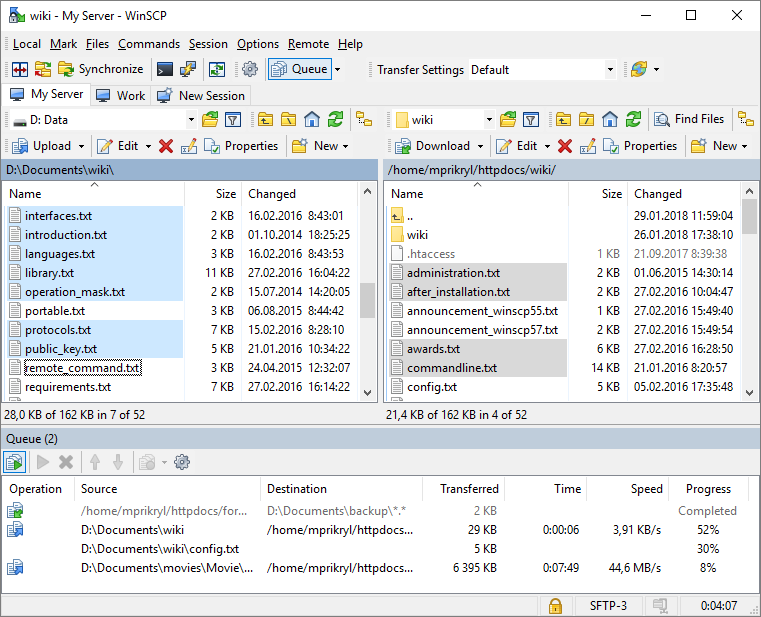 WinSCP is the best free SFTP client by a long shot! fire ftp is cool. To be honest, filezilla may be the most popular but I think it is the most annoying!! I have been using Filezilla from the above 5 best FTP programs. It is simply great is available for free. This is free but its features and qualities are much advance than many paid FTP programs.